Facebook vs. Google+–Why You Should Try Google+! You are here: Home / Great Deals / Facebook vs. Google+–Why You Should Try Google+! Have you joined Google+, yet? Here’s why I think you should – if you want to see everything you told Facebook you wanted to see when you “Liked” pages. I have told you for a while now about all of the changes Facebook keeps making that makes it harder and harder for anyone to see what pages like Grocery Shop For FREE post. It can be very annoying to not be able to see the deals, and it’s also very annoying to write them all up and post them and hope you might se them! 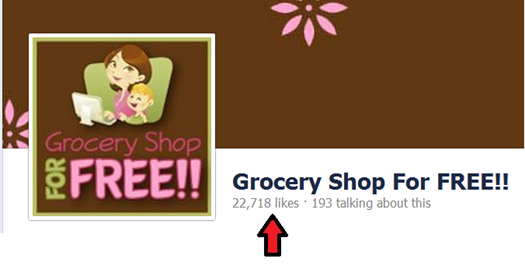 The Grocery Shop For FREE Facebook page has over 23,ooo Facebook followers. But, Facebook decides who sees what. Facebook says if you Like, Share, Or Comment on a page then that means you want to see it in your stream – so they will show it to you – for a short time until you Like, Share, or Comment there again. 121 people saw that post. 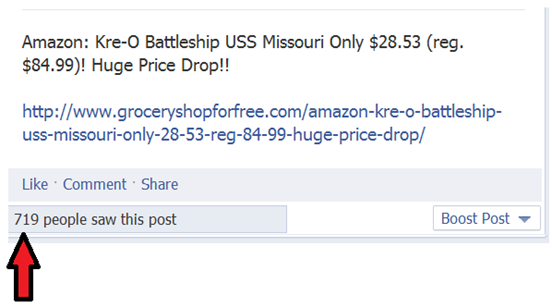 That is the same post – posted right after the other one without the image and it is shown to 719 people. So, what if I pay Facebook more? 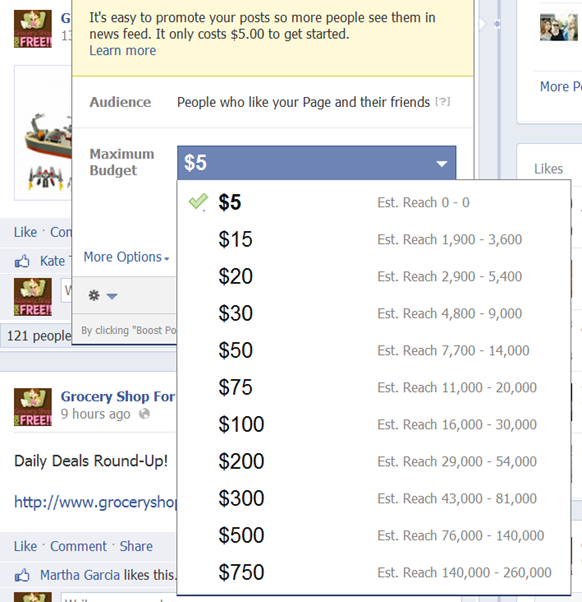 So according to the Budget above – to reach all of the people who “Liked” the Grocery Shop For FREE page and said they wanted to see the updates in their stream – I would have to pay $75 per post. So, for say 20 posts a day that = $1500 a day x 30 days = $45,000. a month for the people who ASKED to see the updates to be able to see them! Well, the whole point of this post was not that – I sidetracked, sorry! The point of the post is – Google+. The best thing is – you see EVERYTHING you want to see – they don’t hide anything from you! You should check it out – it looks great! So far all of the changes they have made have been for the BETTER, not like all of the Facebook changes that makes us all crazy! Check out Google+ and while you’re there follow Grocery Shop For FREE on Google+ – then you’ll see everything! THAT’S the main reason why you should try it – you’ll see everything posted by the pages you follow – not just what a computer algorithm decides you want to see! Have you joined Google+, yet? How do you like it? 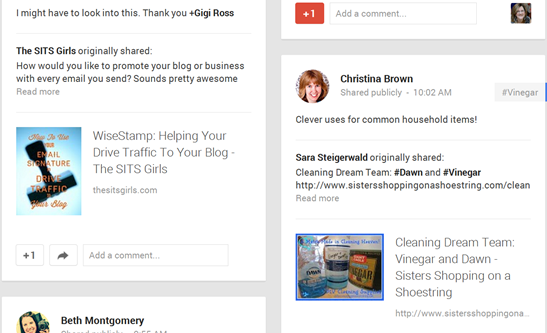 I am in love with Google+! They do an update, and it makes for a BETTER user experience. Facebook does an update, and everything is worse. It is like Facebook does a survey to see what the worst possible user experience, and then implements the negative results. Let me start by saying that you are correct in every assertion in your post. 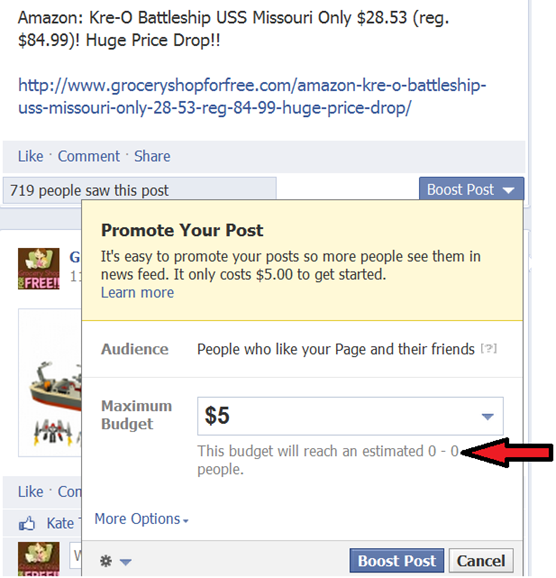 Facebook wants you to pay to have your page’s posts seen. That being said, however, I have to say that the reasons why those two particular posts have different numbers is that Facebook doesn’t like to surface posts that are just links. I’ve noticed the same thing in the Hoot Suite social analytics for my site. Keep preaching the good word on G+, though. I love it, too. The only problem is that it’s only active in a few key niches (Tech news, and photography being the big ones.). 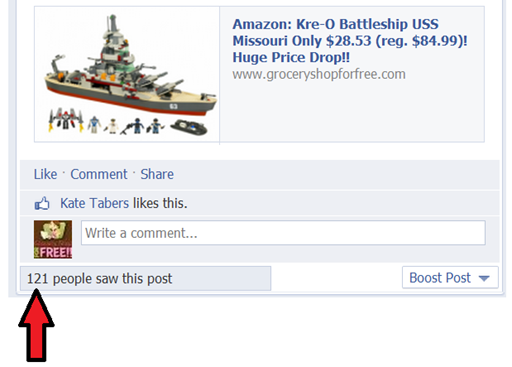 Andrew » Yes, I agree – but, no matter how I post on Facebook I never reach more than 1/10th of the pages “Likers”. If I post an image and no link – it gets even less than the link where it pulls the image. The Frugal Deals niche on Google+ has a pretty good hold now, IMO.